Hp1β (CBX1) is a component of heterochromatin that recognizes and binds histone H3 tails methylated at 'Lys-9', leading to epigenetic repression (1). Hp1β do not associates with chromosomes during mitosis (2). Interaction with lamin B receptor (LBR) can contribute to the association of the heterochromatin with the inner nuclear membrane (3). Recombinant human N-terminal His tagged Hp1β was produced in E. Coli, purified using FPLC and formulated in a storage buffer containing 20mM Tris-Cl pH 7.6, 1mM EDTA, 0.15 M NaCl, 10% glycerol, 0.5mM PMSF and 1mM DTT. Protein concentration was determined by spectrometry. >98% purity by SDS-PAGE. 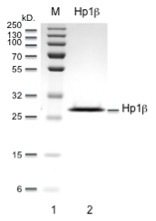 SDS-PAGE gel of recombinant Hp1β (Lane 2). Lane 1, protein molecular weight marker.